How Industrial Lubricants Market Is Positioned in India? The Industrial Lubricants Market in India has reached its maturity stage, therefore meeting demand expectations of every end user industry (construction and mining, metal production, power generation, general manufacturing, food processing, pharmaceuticals and cosmetics) majorly by importing base oil from foreign countries and domestically producing lubricants within India. The market has been growing majorly due to rising usage of hydraulic oil, industrial gear oil and industrial greases in major end-user applications. Over the review period, India industrial lubricants market observed a healthy growth both in terms of revenues as well as consumption volume. In the FY’2013, the market generated revenues worth USD ~ million alongside a sales volume of ~ million litres. Significance of smooth working of machineries coupled with the prevention of equipment failure owing to lack of lubricity and excess friction are some of the driving forces for industrial lubricants growth. 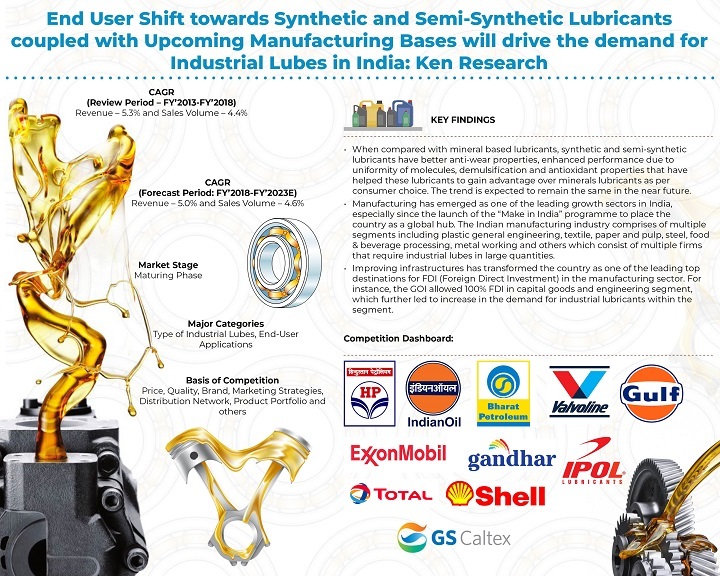 Rising concerns from major industries regarding the maintenance of machineries in order to provide a better quality output has escalated the demand for synthetic and semi-synthetic lubricants in the country. After facing an economic slowdown during the period FY’2016-2017 owing to temporary disruptions caused by demonetization and GST implementation; the market recovered in FY’2018 with uniform cash flows, easy taxation as well as further growth in India’s manufacturing industry. India industrial market revenues were evaluated at USD ~ million whereas, the sales volume rose to ~ million litres in the FY’2018. Mineral oil based lubricants were witnessed to dominate India industrial lubes market during FY’2018 with a revenue share of ~%, thus evaluated at USD ~ million and a volume share of ~%, contributing ~ million litres. These types of lubricants have been gaining traction in India majorly due to its economical price over semi-synthetic and synthetic types which are costlier as they require highly refined base oil and high quality additives that add to cost of production of these lubricants. The remaining revenue share ~% and volume share of ~% was collectively captured by synthetic and semi-synthetic lubricants in India industrial lubricant market during FY’2018 which is slowly gaining traction in the country. Hydraulic oils established itself as market leader in the India industrial lubricants market along with volume share of ~% in the FY’2018. Greater index of viscosity, higher bulk modulus bulk modulus, hydrolytic stability, resistance to wear and demulsification are some of the characteristics which are evaluated while choosing suitable hydraulic oil lubes. The remaining volume shares of ~%, ~%, ~%, ~%, ~% and ~% were captured by other lubricant types including metal working fluids, industrial gear oils, turbine oils, compressor oils, industrial greases and others respectively in FY’2018. The usage of industrial lubricants in India was observed to be high in construction, mining and off-highway equipment sector with a volume share of ~% of total sales volume of industrial lubricants in India during FY’2018. As India’s construction and mining sector are catching up fast with its global counter-parts in terms of technological advancements, the demand for hydraulic oil has shifted from not just being volume driven but more of value based. The remaining volume share of ~% were collectively captured by industrial end users such as iron and non-iron production, general manufacturing, textile and chemicals; engineering equipment, automotive sector, power generation, cement and others respectively during FY’2018. Direct sales were majorly used by PSU OMCs and international private players in India. The segment dominated with a massive volume share of ~% of the total sales volume of industrial lubes in India in the FY’2018. Companies prefer selling lubricants directly to customers than via dealers as payments are highly irregular from dealer network. The remaining ~% volume share in India was grabbed by the dealer network in FY’2018. The northern and southern regions in India were witnessed to dominate the country’s industrial lubes market with a collective volume share of ~% in FY’2018. The remaining ~% volume share in India industrial lubricants market was captured by western and eastern states during FY’2018. Barrels, drums and tanker load were witnessed to dominate the lube packaging in India industrial lubricants market with a massive volume share of ~% in the FY’2018. They have a holding capacity of ~ or ~ litres. Smaller packs with a holding capacity of ~ or ~ litres captured the remaining ~% volume share in India industrial lubricants market in the FY’2018.